Welcome to the new era with intelligent manufacturing solutions that transform the value chain beyond the factory walls. Mobile apps aren’t just a customer service tool. With robust and secure manufacturing apps for the manufacturing industry, you can transform your business into a streamlined unit with a centralized command center to improve your bottom line by huge margins. The key factor that defines business-value for your business is how streamlining operations can increase your overall bottom line. A robust mobile app can streamline operations by empowering employees to increase efficiency to an optimal state. The other factor is the power of a mobile app to cut admin costs, improve data collation and provide real-time analysis, which helps the business make improved decisions, which also saves a lot of time and money. Automate production for optimized delivery with materials management, space and storage management across various locations, etc. 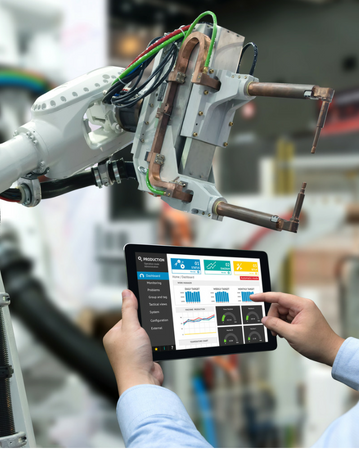 The Mobile App Maker has first-hand knowledge of what the manufacturing industry requires for digital transformation to take full effect. With the Mobile App Maker mobile app development services, you can transform your manufacturing business to a smart business by eliminating silos and making sure that your concern works as one unified unit.